Lifestyle hotels have been an important trend in recent years and they are flourishing, and it looks like they are not just a passing fashion. Which hotel groups are targeting this niche and what does their supply look like? A look at lifestyle brands belonging to major hotel groups. The boutique-hotel concept came about in the 1980s in New York in contrast to the standardization that prevailed at hotels belonging to major chains. The boutique-hotel promotes a unique style based on a concept and a personality that are specific to it and distinguish it from its competitors. They also combine the following characteristics: they are located in major cities and lively or trendy neighborhoods, have stylish architecture or design, decor articulated around themes referred to by their decorative objects and details which also create an intimate ambiance, with personalized service being an important factor in differentiation. The intimacy of the boutique-hotel concept requires its capacity to be limited. A variation of the lifestyle spirit, hybrid hotels focus on a catering offer, co-working, celebrations and events in addition to accommodations. MGallery was created in 2008 and positions itself as a collection of "high-end hotels with character". The first MGallery Hotel opened its doors in London in 2011. In 2016, MGallery was renamed MGallery by Sofitel, which defines itself as a "collection of boutique hotels dedicated to lovers of life, literature and culture". Each hotel is inspired by the history of the place where it is located which is reflected in the common spaces, in the rooms and even in signature dishes and cocktails. If history is the common thread of the MGallery by Sofitel collection, the collection includes a variety of historical luxury hotels having hosted political figures, poets, famous authors, as well as hotels with modern design. Heritage hotels are centered on heritage and history through architecture and paintings on display, while Signature hotels have a strong sense of style and design. Finally, Serenity hotels are located in selected locations: along the coasts in the mountains or on a quiet street in a major city. MGallery offers culinary and gastronomic experiences in a relaxed and friendly atmosphere, as well as lounges and wellness areas (spa, sauna sessions, yoga classes, gym, fitness room). Some hotels offer their guests the "Inspired by Her" service collection, a selection of balanced dinners, thalassotherapy treatments, aromatherapy oils and a wide choice of herbal teas in rooms. The brand also capitalizes on its "Memorable Moments" offer: special memory-creating moments such as a gift upon arrival, a romantic dinner on the beach or a helicopter flight. MGallery does not have an individual account on social networks, but it is present through Sofitel on Instagram and Pinterest where the brand insists on the quality of photos, a heavenly spirit, happiness, well-being. On Facebook, it's more about information, event partnerships, anecdotes. Mama Shelter was created by the Trigano family (Serge Trigano and his two sons). The first Mama opened in 2008 in Paris in the 20th arrondissement. 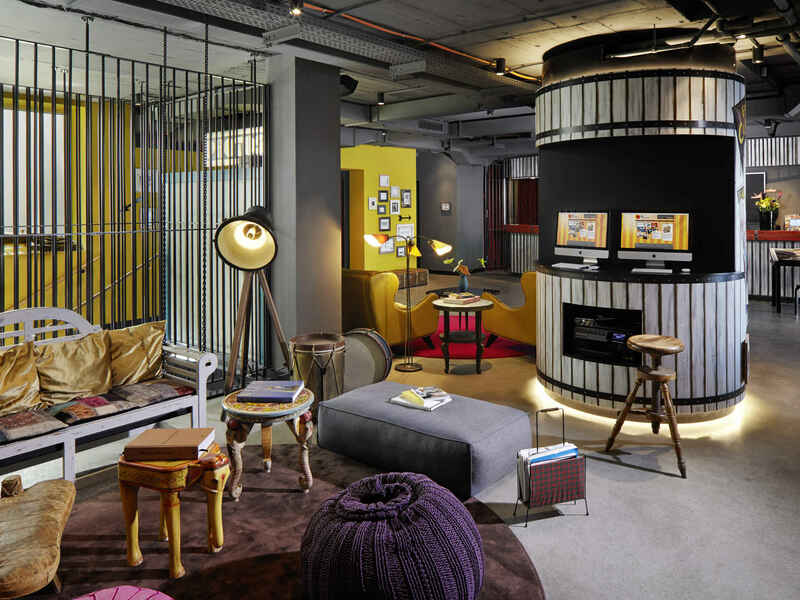 In 2014, AccorHotels bought 35% of Mama Shelter, allowing the brand to accelerate growth. The places are chosen by those who want to spend time there while feeling the vibrations of the city. The Triganos conceived the philosophy of the Mama Shelter as "a restaurant with rooms above", and more broadly as a place to live "a moment of happiness, whether you come to eat, read or sleep". The hotels are chic, atypical, affordable and popular. They claim social diversity and immerse themselves in the city where they are located. The rooms are deliberately minimalist. The brand is committed to offering its guests multimedia services: allowing them to watch television and free films on demand, listen to the radio, connect to the Internet, have access to a guide about places to visit near the hotel, and take pictures or film themselves with Photo and VideoBooth. Like the Mama Shelter in Paris which houses a shop selling travel essentials and rare and unusual items, the online shop also sells Mama Shelter products. On social networks, the brand highlights its thematic and musical events, as well as its creations ("Hey Mama" magazines, objects, brunches, cocktails...). Mama Shelter is present in Paris, Marseille, Lyon, Bordeaux, Los Angeles, Rio de Janeiro, Belgrade and Prague and will open locations in Toulouse, London, Lille, Lisbon, Paris Porte de Versailles, Paris La Défense, Luxembourg and Dubai by 2020. Mama Shelter boasts 1,036 rooms and 8 restaurants in France and internationally. The latest addition to the AccorHotels group, JO&JOE is positioned to be the home of Millennials, a budget hotel brand for young travelers, members of nomadic and international communities. Whether you are alone, a duo, a family or a group, the brand ensures that everyone will find their place. The brand claims its concept of "Open House" as an enhancer of experience through an offbeat design, a digital universe and a community catering offer. As at Mama Shelter, JO&JOE encourages exchanges inside and outside. It is designed for both Townsters (local residents) and Tripsters (those who explore it). They animate the address in particular by being active on the brand's geo-social application, which seeks to put people in touch with each other. You can sleep there, attend a concert, or take a yoga, crafts or cooking class. The spaces are declined as follows: the "Happy House" private space reserved for Tripsters who can relax, work, cook, do laundry; the "Together" is a shared, modular sleeping space; the "Yours" are rooms and/or apartments for 2 to 5 persons with a private bathroom and a kitchen space depending on the number of people; the "OOO!" for "Out Of the Ordinary" characterizing unique accommodations that are different from one address to the other (yurt, hammocks, caravan). At the heart of the social experience is the bar, which favors local and artisanal products, as well as the F&B offer, which focuses on simple and authentic catering styles: rotisserie, barbecue grill, wok and pizza oven. On social networks, JO&JOE affirms its offbeat side by adopting a humorous tone on Facebook where videos are posted as well as a more colorful and summery spirit. The brand wants to develop in city centers, in lively areas, close to public transport and near the main attractions of a destination. After a first opening on June 2, 2017 of the JO&JOE Hossegor, the brand aims to develop rapidly to 50 destinations by 2020, with operations in Paris and Bordeaux in 2018 and in Warsaw, Budapest, Rio and Sao Paulo. Founded in 2003, 25Hours is a German brand that meets the needs of the cosmopolitan urban traveler who is particularly interested in culture and brand image. Positioned in the "very upscale mischievous" segment it focuses on works of art, vintage objects and details more than design and furniture, which nevertheless remain present. In November 2016, AccorHotels acquired a 30% stake in 25Hours Hotels. As a strategic partner of 25Hours, AccorHotels will support its long-term growth and global development. The brand also relies on its teams who have a great deal of empathy and thus rejects digital service. Finally, the customer should feel as if he is at home surrounded by his friends rather than "king". In the city, the average number of rooms per property is around 100 to 250, while the average size of rooms is between 30 and 35 m². Each address plans to offer a local restaurant concept, a bar, a wellness area with a fitness center and swimming pool, as well as meeting rooms. 25Hours is present on many social networks with fun facts, feel-good movies, offbeat presentations of hotels and rooms, publications that promote F&B as well as staff. In its portfolio, 25Hours has 10 hotels with 1,347 rooms in 3 countries: 7 properties in Germany, 2 in Switzerland and one in Austria. At the time of the brand's announcement, 5 new hotels representing 1,248 rooms were planned: with two in Germany and one in Paris opened in 2018, and one in the United Arab Emirates (440 rooms) and another in Italy (171 rooms) which will open soon. The Hotel Indigo brand was launched in 2004 by InterContinental Hotel Group. Hotel Indigo wants to offer a customer experience that takes into account the history of the neighborhood, the community where the property is located. Hotels try to offer a breath of fresh air starting at the doorstep. Hotel Indigo properties are for city dwellers, "inspiration seekers", travelers looking for new experiences, individuals who appreciate local art, design and culture. The unexpected is provided by dynamic, engaging and intriguing sensory cues. Rooms are equipped with quality bedding, murals that capture local imagery and spa-inspired showers. On social networks the brand does not hesitate to highlight the best places around its hotels for walking, culture, enjoying a drink or a local dinner. The brand is present in major city centers, urban centers and suburban environments, and it is currently expanding internationally in key markets, with over 80 hotels in the current pipeline. Hotel Indigo has 88 operational hotels with 10,888 rooms and 86 hotels in the pipeline. (As of March 31, 2018). The brand revealed the details of its portfolio (as of September 30, 2017): United States (48), United Kingdom (11), China (5), Germany (3), Spain (2), Finland (1), France (1), Indonesia (1), Israel (1), Mexico (1), Poland (2), Russia (1), Singapore (1), Thailand (1). Founded in 1981 and acquired by IHG in 2015, Kimpton Hotels & Restaurants considers itself the industry's pioneer that introduced the concept of boutique hotels in San Francisco, California, USA. The idea was to create a place to stay that looked more like a beautiful, elegant, livable house than a large impersonal hotel. Kimpton Hotels & Restaurants is committed to making travelers feel truly taken care of with thoughtful advantages and amenities, inventive meetings and events, bold and fun design and caring staff. The brand customizes its hotels from design to menu in order to reflect the destinations that should be a "home". Restaurants and bars (sometimes award-winning) are key features of the brand, which operates its restaurants separately from its hotels, with commercial strategies focused on restaurant profitability. As of March 31, 2018, Kimpton had opened 66 hotels for 12,517 rooms. 20 hotels are in the pipeline. Its portfolio is composed as follows: United States (63), Caribbean (1), Netherlands (1), Canada (1). After its first European opening in Amsterdam, The Kimpton Paris will be the brand's second European boutique hotel. Kimpton also plans to open on the Asian continent with 4 properties: in Bali, Shanghai, Taipei and Sanya. Jaz in the City, a brand by Deutsche Hospitality group, was launched in 2015 with the concept's arrival in Amsterdam. The second hotel opened in Amsterdam in 2018 and a third address in Vienna is planned for 2020. Jaz in the City is inspired by the musical, cultural and gastronomic scene of the cities where the properties are located. The brand invites artists to liven up the hotel with regular concerts or DJs at their turntables in the hotel lobby. Music is adapted to the time of day and the hotel's location with electro groove and "chill" atmosphere styles. The hotel itself becomes a stage and the stay an event. Jaz in the City also offers spaces with a" cool and modern" design where technology is present in the experience (software, systems controlled via a tactile control panel in the conference room). On social networks, the brand highlights compositions by the artists it has hosted, communicates about events with which it is a partner, and the creations or initiatives of its staff. Launched in 2014, Curio Collection by Hilton is, as its name suggests, a group of "hand-picked" hotels that encourage the curiosity of its guests through their explorations, discoveries and outings. The hotels claim uniqueness, and are independent with their own stories and personalities, highlighting local particularities. On social networks, the brand of the Hilton group highlights its epicurean spirit with dynamic and colorful videos, culinary creations, quizzes and hotel presentations. The brand is present in the United States (39), Argentina (1), Belize (1), Costa Rica (1), Honduras (1), Jamaica (2), Mexico (2), Puerto Rico (1), Saint Lucia (1), Nigeria (1), China (2), Japan (1), Australia (1), France (3), Germany (1), Iceland (1), Italy (3), Spain (2), United Kingdom (2), Qatar (1). Launched in 2014, Canopy by Hilton focuses on welcoming, attentive service, enthusiastic and warm staff. The hotels want their guests to discover local cuisine as well as art, music, sports and entertainment. With simple comfort and good value for money, however, hotels claim a unique character offering a stimulating environment in which to work, rest and have fun. Basic WiFi, homemade breakfast are included, as are a welcome gift, and a tasting of local beer, wine or spirits. On social networks, Canopy by Hilton uses the orange tones of its brand, shares the photos of its guests, highlights the assets of its hotels and their surroundings. The brand still has a discreet presence: United States (2), Iceland (1); but is developing several addresses: in the United States (3 addresses planned by the end of 2018, and 10 in 2019, 1 in 2020), China (1 hotel planned for the end of 2018 and 1 in 2019), Croatia (1 hotel planned for the end of 2018), Canada (1 hotel planned for the end of 2019), Malaysia (1 hotel planned for the end of 2021). The 14th brand of the Hilton group, Tapestry Collection by Hilton was created in 2017. The notion of "tapestry" evokes a unique work of art. The brand was created in response to the demand of customers and owners for original, independent, high-end hotels with their own personalities. The portfolio consists of 10 hotels in the United States. In May 2018, the brand announced its intention to develop for the first time outside the country with the signing of two new properties in Lima, Peru. These addresses are part of the development pipeline for eight Hilton hotels in Peru. Acquired by Wyndham Hotel Group in 2010, the goal of the brand Tryp by Wyndham is to plunge its guests into city centers; it considers itself as much of an experience as a destination. Local collaborators are available to inform and guide clients on their culinary and festive adventures in the city. The brand offers several types of specialized rooms such as Family rooms with bunk beds for children, Fitness rooms including sports equipment and Premium rooms to enjoy a luxury experience. With the Plaza Central on the ground floor of the hotel, Tryp by Wyndham also promotes community culture. On social networks, Tryp Hotels celebrates the community, their hotel destinations, architecture, renovations, gastronomy, events, ambassadors and influencers. Tryp by Wyndham's portfolio is composed as follows: China (1), Mexico (1), Puerto Rico (1), USA (7), Australia (1), Colombia (3), Myanmar (1), Spain (24), Uruguay (1), Belgium (1), Costa Rica (1), Panama (1), Turkey (2), Philippines (1). Esplendor Boutique Hotels is a boutique hotels concept in Latin America. The brand blends design, avant-gardism and the uniqueness of experience in both historic buildings and brand-new, modern properties. It features a sophisticated style with upscale rooms, art galleries, Bar & Lounge, Restaurant & Casino and a fitness centre with spa. Esplendor Hotels' portfolio consists of the following: Argentina (7), Peru (1), Paraguay (1), Uruguay (2).